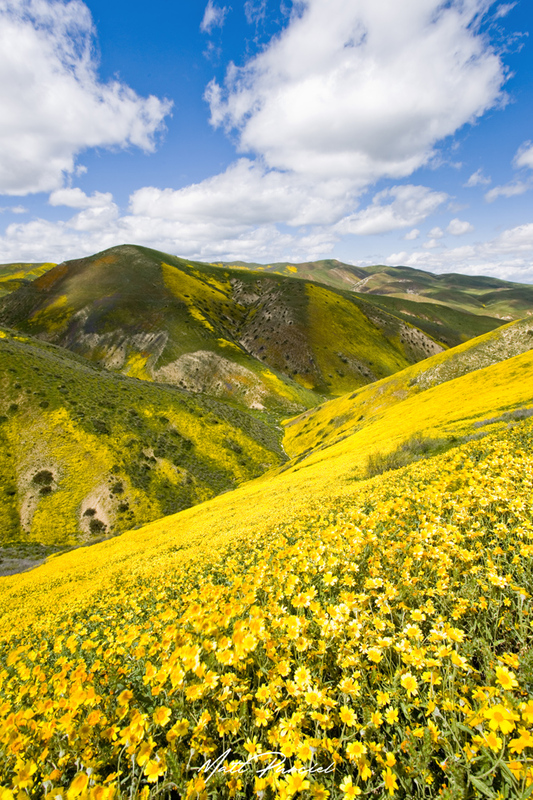 The Carrizo Plain superbloom in 2017 was off the charts and one of the best in the last ten years. I heard it was good out at the Carrizo Plain so made the three hour drive out to the badlands. Upon driving up some backroads, I was happy to come across this spectacular scene. It just put a smile on my face. The yellow coreopsis wildflowers were endless as far as the eye could see! It was almost like God spilled paint on the hills. I've been the Carrizo Plains for a number of years, but I've never seen the wildflowers quite like this. Normally it's a dry grassland with rolling hills. But this year with all the rains that year the hills exploded in color. You can find fields of purple, orange and yellow as far as the eye can see. Not to mention the fragrance of the flowers. I couldn't get enough of photographing Carrizo Plain and the superbloom. Hopefully we'll get another one soon!